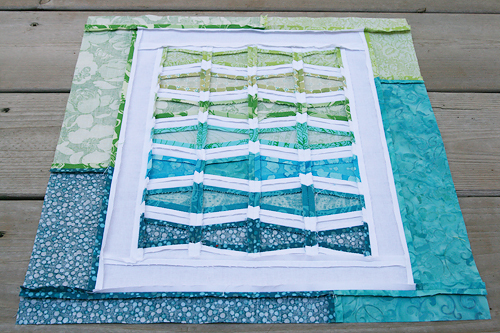 July was Gretchen's month for the Sew New to Me Virtual Quilting Bee. This was a great month because the design of the blocks was left completely up to us. Gretchen only told us that these blocks were for a beach quilt, so to make them "beachy". Up to our interpretation. At first I had no clue what to do. 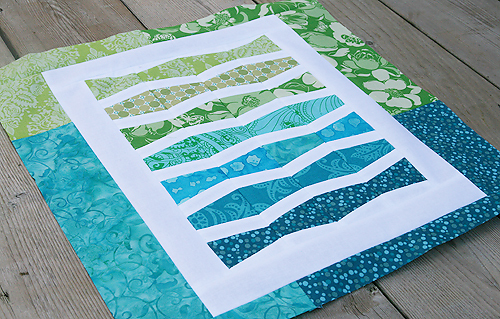 But inspiration struck and I decided to do a miniature version of the New Wave Quilt from Oh, Fransson! All was going great at first. Rather than pieces that are 6"x9", I cut 2" x 3", with 1" wide white stripes in between. Some of you probably already know this, but when you are dealing with such small pieces, that leaves little room for error. Especially with this many seams and points. Originally this block had 6 columns of waves. But the squaring up process required me to remove 2 of them. I think it still works though, and I love how the green and blue sashing turned out. I hope Gretchen likes her block, it was a blast to make!